Dr. Smith's ECG Blog: Wide Complex Tachycardia in a 20 something. This was sent by a former resident. He will remain anonymous because his identity could compromise patient confidentiality. A 20-something female presented with palpitations and lightheadedness. She had no previous medical history except for some "in utero tachycardia" which was treated until a very early age. She has had no problems since and takes no medications. She has no specific conduction abnormality diagnosis. Her mother states she is not thinking clearly ("acting as if she is intoxicated"). The patient reports exertional syncope and was syncopal on the way to the triage desk. Exam: Very large, at 5' 10" (178 cm) tall and 346 lbs. (156 kg). There is a regular wide complex tachycardia at a rate of 231. 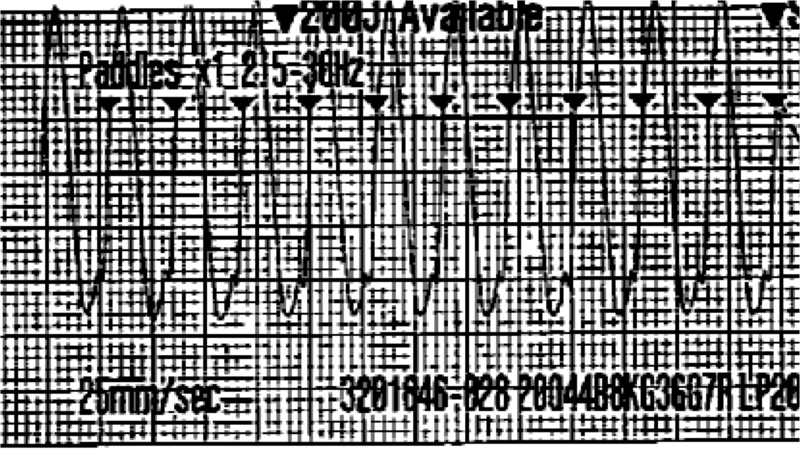 There is no recognizable morphology, such as RBBB or LBBB. The initial portion of the QRS represents prolonged depolarization, arguing strongly against SVT. There are small waves in lead II across the bottom. Are these retrograde P-waves? The rhythm strips, which unfortunately were not recorded, reportedly showed irregularity, with a rate varying from 180-250. Because of this irregularity, the treating physician was worried about Atrial fibrillation and WPW, and therefore was reluctant to give adenosine. See here for a discussion of Atrial fib and WPW, and the danger of adenosine and of other AV nodal blockers, and of the safety of these medications if it is NOT atrial fibrillation. What would cause this rhythm but have some irregularity on the rhythm strip? Could this be atrial fibrillation? Is adenosine really contraindicated? It is very important that you recognized that the ECG shown CANNOT be Atrial fibrillation with WPW. 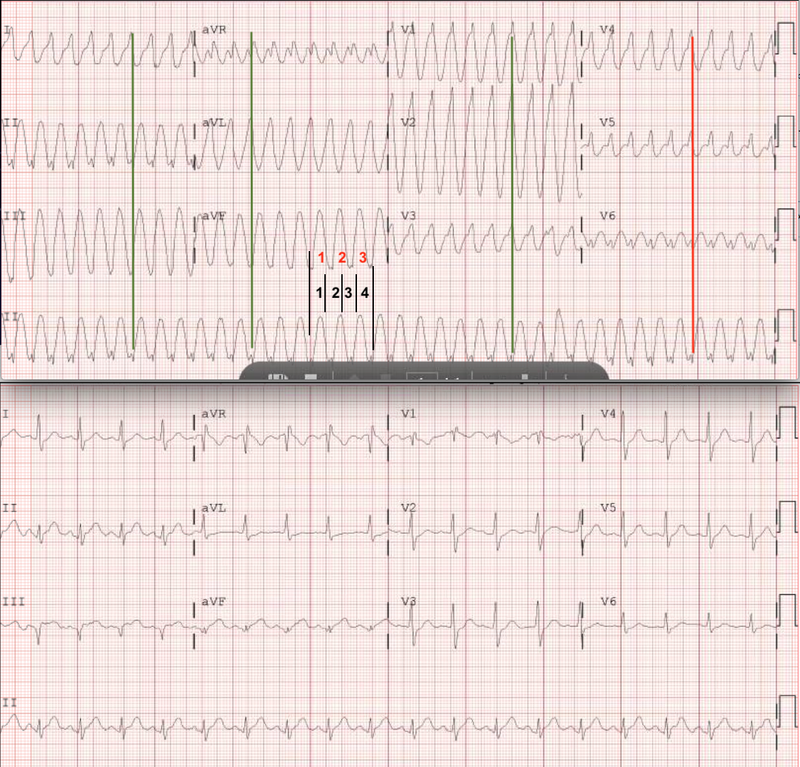 2) When you have atrial fibrillation with WPW, there are multiform QRS complexes. Procainamide was administered. There was no response. Labs were normal. K was 3.5 mEq/L. Electrical Cardioversion was the next step. As the BP was stable after some fluids, low dose propofol (60 mg) was used for sedation. Are the sync arrows pointing to a T-wave? Or QRS? If the point to the T-wave, synchronized cardioversion could result in ventricular fibrillation. 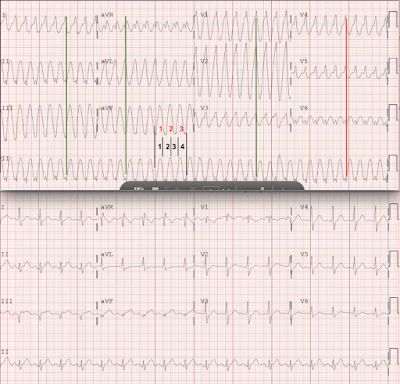 See this post demonstrating dangerous and erroneous identification of the QRS. Cardioversion was done at 200J biphasic. The cardioversion occurs almost halfway through the strip. There is conversion to Polymorphic VT or Ventricular Fibrillation. Color and BP were improving and she was awakening. Consultant recommends amiodarone and repeat cardioversion. This was done without success. She is defibrillated into an organized wide complex rhythm, which then becomes a narrow complex tachycardia with occasional wide complexes. Sinus rhythm. There is no good indication of underlying pathology. She remained on the esmolol drip and had no more dysrhythmias. Cardiac MRI was normal. Echo was normal. EP study was done. See below. Was there an irregular rhythm? We must take the word of the physician. Was it atrial fibrillation? On the initial ECG, it certainly is not atrial fibrillation. Therefore, if the irregular rhythm was atrial fib, then the patient was flipping back and forth between a rapid atrial fib and a regular wide complex tachycardia. This is very improbable. It could be what it was proven to be on EP testing: Dual AV nodal pathways and WPW (there is no delta wave, and thus there is 'concealed conduction'. Read this to understand concealed conduction. 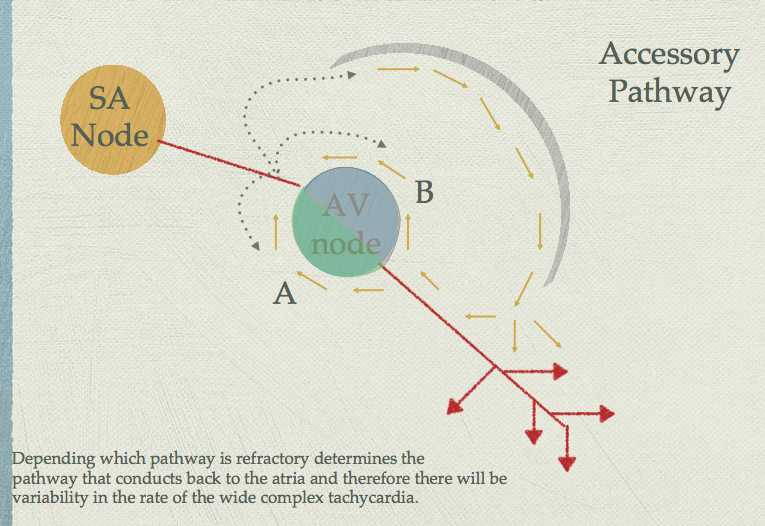 In this scenario, the dysrhythmia is antidromic AV reciprocating tachycardia (AVRT) that goes down the accessory pathway and up either one of two AV node pathways. The resulting rate depends on which pathway is used. 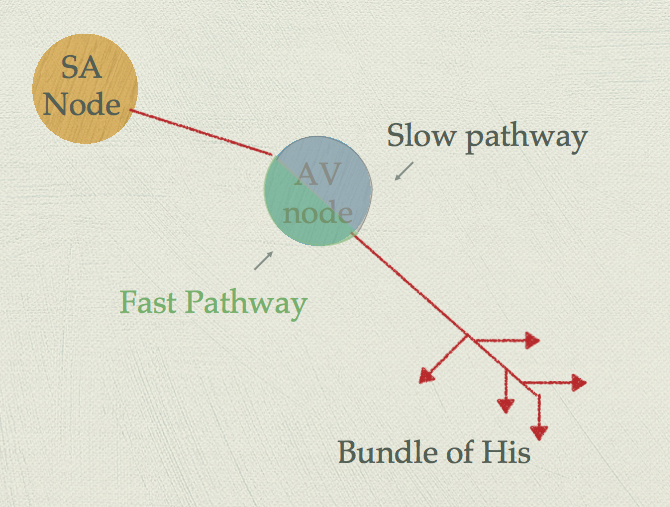 Ablation of the Bypass tract (Accessory Pathway) was completed. How would I have managed this? I would have attempted adenosine. It is not atrial fib with WPW. If it is VT, adenosine will be safe. It might work. If adenosine does not work, then cardiovert. I believe adenosine would have worked here. I have talked with Ken Grauer about his comments below. We are now agreed that this was indeed a wide complex tachycardia due to antidromic WPW. Figure-1: Combining the initial tachycardia tracing with the post-conversion 12-lead ECG (See text for discussion). Even if the QRS complex was wide — my interpretation in an otherwise presumably healthy 20-year old woman who presents hemodynamically stable in a regular wide tachycardia at this fast a rate (~240/minute) — would be that this may well be AVRT conducting anterograde (ie, first down an AP). In either case (ie, whether the QRS was narrow or wide) — I completely agree with Dr. Smith that Adenosine would seem the clear drug of choice! (ie, low chance of significant lasting adverse effect — and excellent likelihood of converting AVRT with either anterograde or orthodromic conduction). Note that I’ve attached the post-conversion 12-lead ECG to the bottom of Figure-1. Doesn’t the narrow QRS in the post conversion tracing resemble somewhat what I suggested above might reflect a narrow QRS during the tachycardia (vertical RED and GREEN lines)? We are told that EP testing revealed, “Dual AV nodal pathways and an Accessory Pathway, but no Delta wave” — therefore AVRT in which conduction is orthodromic (ie, first going down the normal AV nodal pathway [which is why the QRS may be narrow] — and then coming back up the AP). Given that delta waves are not seen in either the tachycardia or post-conversion tracing — isn’t my theory that the QRS in the initial tracing (TOP in Figure-1) is actually narrow because this is orthodromic AVRT with marked ST-T wave changes plausible? The differential diagnosis of the wide complex tachycardia is VT or a *preexcited tachycardia*. Antidromic AVRT is only one mechanism of preexcited tachycardia. Others include ventricular activation via a bystander accessory pathway of atrial tachycardia, atrial flutter, or AVNRT. Rarely, pathway-to-pathway circus movement tachycardia can cause a preexcited tachycardia. Adenosine would terminate antidromic AVRT and AVNRT using a bystander bypass tract for AV conduction because the AVN is involved in the mechanism of both of these arrhythmias. Adenosine would not be expected to terminate VT, or AT/AFL using a bystander bypass tract, nor would it be expected to terminate pathway-to-pathway circus movement tachycardia. In any of these situations, adenosine could cause atrial fibrillation, which could represent a medical emergency if the bypass tract has a short enough refractory period to permit a very rapid preexcited ventricular response to AF. A concealed bypass tract only conducts retrogradely (from ventricle to atrium). Accordingly, these bypass tracts can participate in *orthodromic* AVRT. You are describing a *latent* bypass tract - one that is not apparent in sinus rhythm because conduction over the normal AV conduction system preempts ventricular activation over the bypass tract. Superb case with step-by-step analysis! My understanding is that Adenosine may shorten atrial tissue refractory period - so that this might predispose conversion of a reentry SVT to AFib, which is of course problematic when there is WPW. So IF you KNOW you have very rapid AFib + WPW (which you should know if you have an irregularly irregular very rapid rhythm, in parts over 220-250/minute with QRS widening) - then don't use Adenosine (which has no chance to convert AFib - and which may cause further deterioration to VFib). While there is a theoretical chance that Adenosine might predispose a patient with antidromic AVRT to develop AFib - it may (as per Dr. Smith) alter conduction properties in part of the reentry circuit and thereby convert the rhythm. Onset & offset of action of Adenosine is ultra-fast - so it should in most instances be safe and worth a try. As occurred in this case - if the drug you select causes deterioration of the rhythm - you are right on the scene and should be able to successfully cardiovert. Glad the ending was positive in this case. I presume the patient subsequently underwent ablation therapy? THANKS for presenting! Thanks. Yes, she did get ablated. Yes! That is what happened. Good question. I do not know how to avoid it in this situation. In the case from a week ago that I link to, one can see that it is not detecting the QRS correctly and one can change the lead that it monitors. But in this case, it is not obvious where the T or QRS are and whether the machine is correctly detecting them. My impression has always been that if YOU are unable to clearly distinguish between QRS & ST-T wave - that the machine (defibrillator) may also not be able to do so ... in which case synchronized cardioversion runs the real risk of delivering the energy at the wrong point in time (ie, during the "vulnerable period") - which might predispose to precipitating VFib (or the PMVT that occurred here). Choices are: i) "Chance it" (ie, hope that the machine is selecting the correct time interval to deliver the shock) and Synch anyway; and/or ii) Turn off Sych and deliver an unsynchronized shock ( = defibrillation) that will probably work. And if you select Option i) and you get the wrong result - then do as was done here = immediate unsynchronized shock, and you'll probably convert the rhythm (given that you are right on the scene, so immediate defibrillation should convert the rhythm). But first one should change the monitor leads and see if the QRS and T are more obviously differentiated. Right? Quick question as to timing. After cardioversion the rhythm went to polymorphic VT. Mag was given and PT was defibrillated. In this case the PT required multiple defib attempts. Should these be done in back to back succession of each other? I imagine this would correct the issue, instead of defib, 2 minutes CPR, defib? I don't have all the details, but you have a reasonable idea there.